Gulu University is committed to facilitating community transformation at national and regional levels through its academic programmes. The Masters programmes in MSc. Food Security and Community Nutrition and MSc. Agri-Enterprises development are some of the unique programmes at the University that have a community attachment and engagement model through which students are attached to communities for experiential learning. The university has so far implemented this model for the last three years during which the students have been working with smallholder farmers to address on-farm challenges. One of the needs the farmers identified was the demand for real time information. 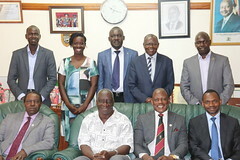 In response to filling this gap, Gulu University with funding from Bill and Melinda Gates Foundation (BMGF) and in Partnership with INSEAD Business Campus (Singapore) and the Regional Universities Forum for Capacity Building in Agriculture (RUFORUM) supported the establishment of the Farmer Call Centre (https://farmercallcentre.totogeo.org). The call centre application is part of TOTOGEO dashboard developed by specialist content developers at INSEAD led by Prof Philip Parker and a proof of concept pilot tested at Gulu University with undergraduate students in 2014 under the supervision of Dr. Basil Mugonola. The call centre APP has both online and offline versions. The offline version is an android phone enabled APP used by students while in the field to give necessary advisory services to the farmers while the online version housed at the call centre office is directly contacted by farmers through a mobile number (+256771318098) in which they are able to be assisted by an operator in their local dialect. The Farmer Call Centre provides information on climate and weather, soil, diseases on crops and plants, livestock and aquaculture (plant and animal doctor), data services and prices. Price and disease information has been the most sought after. The application is able to provide price information for up to 38 specific items as it pertains in different market locations in Uganda. Dr. Basil Mugonola is the PI of the TOTOGEO dashboard including the call Centre but the day to day operation is by the Masters students working closely with undergraduate students. The TOTOGEO dashboard is also relevant to academicians and other researchers, students and the business community in providing data and other timely relevant information. Through the call Centre initiative, we have been able reach out in real time and offer advisory services to between 30-50 farmers per month. The RUFORM funding has also facilitated my Masters study and further facilitated continued delivery of services to the farming community in northern Uganda. Gulu University Call Centre has potential to service the farmers in Uganda and the region as it further continues to be developed. You are encouraged to access the relevant information from the call centre through the website and may call the centre on the above number provided. Am grateful to RUFORUM for funding through the Graduate Research Grant (GRG) and the Institutional Strengthening Grant (ISG) provided to Gulu University that has supported community engagement and my graduate study. I also extend my gratitude to Dr. Duncan Ogeng, Dean Faculty of Agriculture and my MSc. Supervisor, the BMGF, INSEAD business school, Prof Philip Parker and Dr Basil Mugonola (PI TOTOGEO Dashboard initiatives and head department of Rural Development and Agribusiness at Gulu University). Mr. Okidi Lawrence is a Master of Science in Food Security and Community Nutrition student at Gulu University. He is currently in his second year of studies.